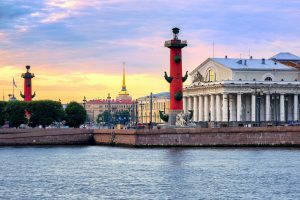 The Glorious Russian Capitals: Moscow and St. Petersburg tour, acquaints with the most beautiful and significant Russian cities, known as constitutional and cultural centers of the country. Discover the great national heritage and extraordinary history of Russia, enjoy true Russian hospitality and cordiality of local people. Transatlantic Flight. Overnight onboard a plane. April 18 – Day 1. Check in into the hotel. Overnight in the hotel in Moscow. April 19 – Day 2. Moscow is the capital of Russian Federation and represents a unique set of old architecture masterpieces and modern high-tech buildings. 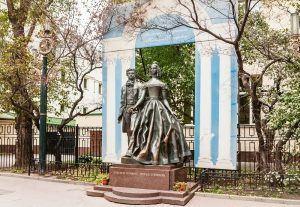 If you want to know more about the history of the Russian capital, you need to take this City tour! In only a few hours, you will have a glimpse of its main landmarks, such as the Red Square, the Kremlin, the Victory Park, the White House, the Arbat, Cathedral Christ-the-Saviour, the observation platform of Sparrow hills, Lomonosov University and much more! It is an interesting and efficient introduction to Europe’s biggest city. 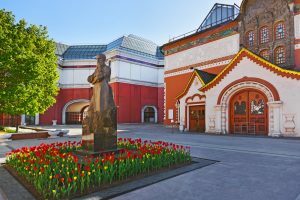 Tretyakov Gallery – a museum of the history of Russian art and the foremost depository of Russian fine art in the world was founded in 1856 by the merchant and patron of the arts Pavel Tretyakov to display the works of Russian artists. It holds the richest collection (more than 150 000 works) of Russian painters and sculptors from the 18th and 19th centuries like Brullov, Kiprensky, Aivazovsky, Ivanov or Repin, as well as the finest collection of Russian icons. Among the treasures of the gallery are “Morning in a pine forest” by Shishkin, “Alyonushka” by Vasnetsov, “Ivan the terrible and his son Ivan” by Repin and many others. April 20 – Day 3. Even if you have seen this place and its landmarks dozens of times, it will be a breathtaking experience to see it in real life. 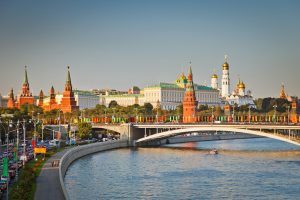 During the walking tour, you will have the time to take pictures of this 73,000 square meters brick-paved square surrounded by the Kremlin Walls, Lenin’s Tomb, St Basil’s Cathedral, Resurrection gate, GUM superstore and the Russian State Historical Museum. Turn to the left, and find yourself in one of the oldest urban public parks in Moscow – Alexander Garden. It keeps a lot of valuable architectural monuments: Kutafia tower of the Kremlin, Italian grotto, an obelisk to the 300th anniversary of the Romanov dynasty, as well as sculptures, fountains and mosaics based on popular fairytales. 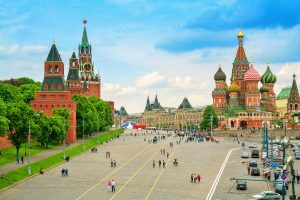 The guide will tell you about the numerous of important historical events, which took place on the Red square and bring you all around it to discover from different points of view. Armory Chamber is one of the oldest museums of the Kremlin. It was founded in 1511, but the construction of the present building dates back to the 19th century. 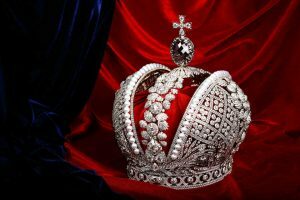 Here you may find a priceless collection of ornate arms and weapons, the Crown Jewels of the Russian Tsars, their carriages and thrones, along with furniture, Royal gowns, jewelry and diplomatic gifts from the 12th to the 19th centuries. 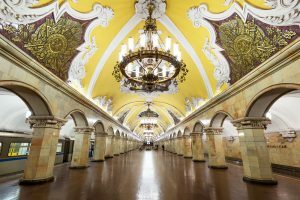 If you wonder why Moscow metro is considered one of the most beautiful in the world, there is a chance to make sure of it! It constitutes a vast museum of underground palaces with impressive interiors, statues and reliefs, monumental and decorative compositions (paintings, mosaics, stained glass and painting) and numerous labyrinths. 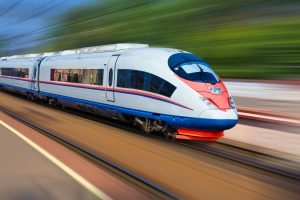 During the tour you will visit the most remarkable stations like Komsomolskaya, Kurskaya, Kievskaya and others, with the experienced guide who will bring you a full insight into their fascinating history. Arbat Street is one of the oldest streets in Moscow. Originally it was a part of an important trade route and was home to a large number of craftsmen. In the 18th century Arbat became one of the most prestigious living areas in Moscow and then a place for the intelligentsia and artists to live. The street nowadays reflects these Page 7 of 15 eventful periods with its elegant buildings, a museum in the house of great Russian poet Alexander Pushkin, a lot of nice shops, cafés and restaurants, an entire wall dedicated to the pioneers of Russian rock and the impressive building of the Foreign Affairs Ministry. 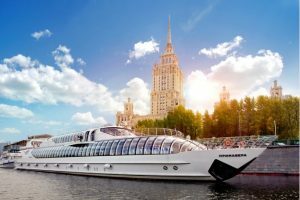 Cruise by Moskva River in the Radisson Ice-Breaker is a great opportunity to admire the panoramic view of Moscow from the spacious open air observation deck of luxurious Radisson boat. April 21 – Day 4. Nowadays Sergiev Posad is one of the most fascinating sights of Russian Golden Ring. It represents the masterpieces of traditional Russian architecture of the 14th – 15th centuries as well as valuable painting objects. 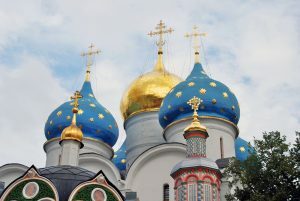 In the Trinity Cathedral – the town’s main landmark – you may glimpse icons painted by Andrei Rublev and Daniel Chorny. Sergiev Posad is a very popular destination also due to its close location to Moscow, so you may easily visit it during your trip to the Russian capital. April 22 – Day 5. Transfer to the Railway Station in Moscow. Overnight in the hotel in St. Petersburg. April 23 – Day 6. During the city tour, you will be taken to the most precious monuments of the city’s rich history and original architecture carefully preserved as the world cultural heritage. You will be able to hear amazing stories and to take fine pictures of the main architectural and historical sites like Nevsky prospect, the Kazan Cathedral, the Winter Palace, Vasilievsky Island, St. Isaac Cathedral, Peter and Paul Fortress, the Senate Square and the Palace Square. The 3-hour sightseeing tour will allow you to get a brief but bright impression of Saint Petersburg. Yusupov Palace. Look in how Russian aristocrats lived before the October Revolution of 1917. The house used to be a residence of the powerful and wealthy Yusupov family and still remains many of its well-preserved original interiors. And Saint Isaac’s Cathedral with Colonnade – the largest monumental orthodox church and the fourth largest cathedral in the world with neoclassical exterior featuring of 112 red granite columns and the main dome 101.5 metres (333 ft) high which is plated with pure gold. April 24 – Day 7. 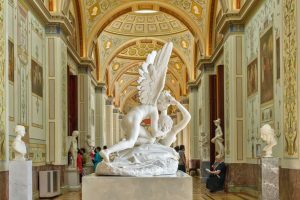 It is hard to imagine a trip to Saint Petersburg without visiting one of the most famous museums worldwide – the State Hermitage. 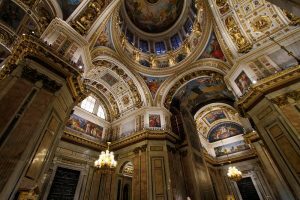 Its priceless collection occupies 5 historical buildings of which the Winter Palace – the former residence of the Russian Royal family – is the most remarkable. Its rooms, decorated with marble and gold provide a fine background for the treasures of the Hermitage. 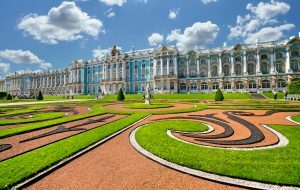 Summer Garden – Tsar Peter the Great wanted to create in his city a garden “more beautiful than the one of the French King in Versailles”. 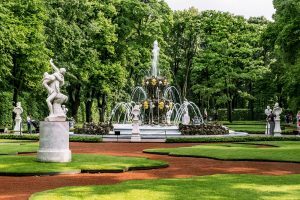 With its patterned parterres, its antique statues and its astonishing fountains, the oldest in Russia, this garden à la française designed by the monarch himself is indeed wonderful. A walk into this charming, picturesque and evocative park surrounded by a refined iron-cast hence and shaded by large oaks is always a step into time. Do not miss this piece of heaven in the heart of the city! This private museum, situated on the banks of Fontanka river, boasts one of the richest and biggest collection of artworks by the famous jeweler Peter Carl Faberge. 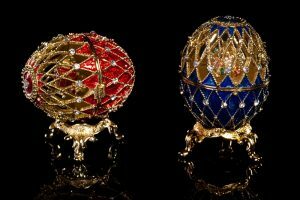 The museum displays a handful of genuine Easter eggs made out of precious metals and gemstones for the imperial family. Also you will be amazed to discover the collection of refined everyday objects created by Faberge, as well as the collection of tableware, master paintings, and Russian icons. Above all, the museum itself is a true jewel-like setting: a perfectly restored palace that will plunge you in the magnificence of the Imperial times. April 25 – Day 8. Located on the southern shore of the Gulf of Finland, 34 kilometers from St.Petersburg, spectacular Peterhof attracts thousands of tourists with its parks, palaces and, mainly, fountains. Among the suburban parks, Peterhof is probably the most famous for its fountains and is thus frequently compared to Versailles. ‘The Samson’ of the Grand Cascade is the most powerful and magnificent one and thus has been made a symbol of the park. As a former residence of the Emperors, Peterhof is also the home of several palaces with the Grand Palace as its main landmark. It had been destroyed by the Nazis and then carefully restored as to exhibit the splendor of the Royal way of life. You will see the halls, brightly decorated with gold, marble and numerous mirrors. 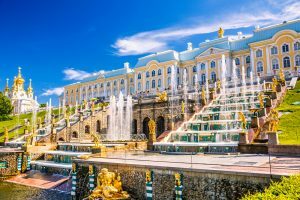 The beauty of Peterhof, its marvelous fountains and palaces has left nobody indifferent, and you will probably be no exception. Enjoy national cuisine and hospitality in the famous Russian style Restaurant Podvor’ye. The Summer Palace is the heart of Tsarskoe Selo (Tsar’s Village) – one of the most picturesque parks among the former residences of the Russian Emperors. Here you may feel the atmosphere of the Royal way of life in its entire magnificence. It is hard to believe that almost everything inside the palace is a result of a careful restoration, which has been finished just 8 years ago. marvelous park and the Catherine’s Palace, definitely one of the most impressive highlight of every visit to Saint Petersburg. April 26 – Day 9.